ANTI-AGING HAWTHORNE - A ROSE BY ANY OTHER NAME..
Hawthorn Berry: (Crataegus oxyacantha (or sometimes called C. laevigata) is a member of the rose family and is found in temperate climates throughout the United States, Europe and Asia. Hawthorn has been used since the Middle Ages, and was considered to be a sacred tree of medicine. Throughout history many cultures have utilized parts of the Hawthorn. In Traditional Chinese Medicine, Hawthorn was primarily used for treating the heart and digestive tract. 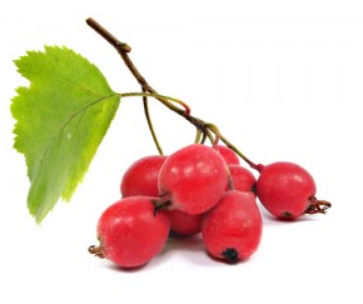 Today, Hawthorn is irreplaceable as a component of cardiovascular health, and Anti-Aging Skin Care therapy is another amazing facet of the wide ranging benefits of the Hawthorn Berry. Along with the berries, the leaves and flowers of Hawthorn contain bioflavonoid-like substances that appear to be responsible for the biologically active properties of this plant. These Bioflavonoids include Vitexin, Oligomeric Procyanidins, Hyperoside and Quercetin. Hawthorn also contains a plethora of various vitamins (primarily B's and C) and minerals, fructose, xanthine derivatives, and beta-sitosterols. Clinical studies have shown that the bioflavonoids in Hawthorn are potent antioxidants. Antioxidants "scavenge" (or clean up) free radicals. Free radicals are believed to contribute to the ageing process by altering cell membranes, tampering with DNA, and can even cause cell death!. Free radicals occur naturally, but environmental toxins (including radiation, excess UV exposure, cigarette smoking, and air pollution) can also increase their number. Hawthorne has been shown to calm irritation in the skin an neutralize the effects of UV radiation (excess sun exposure) making a great addition to many of our product formulas!